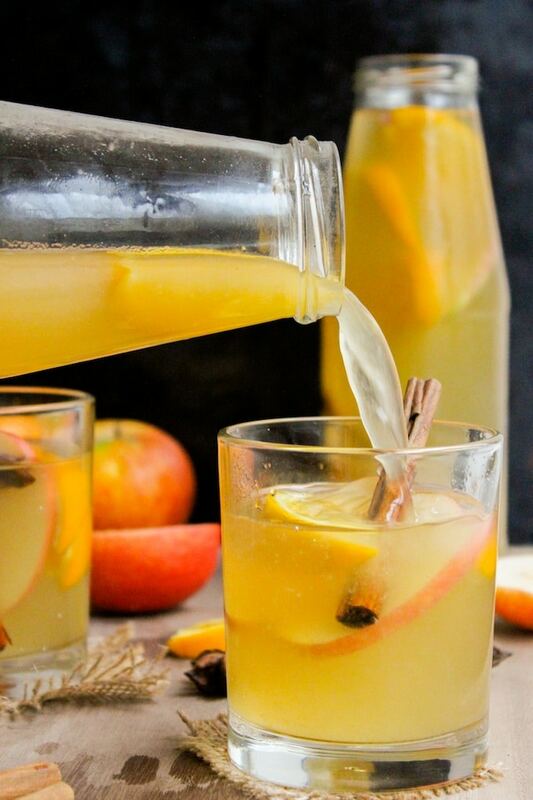 Fall in love with this apple pear cider made with fresh fruit and seasonal spices. 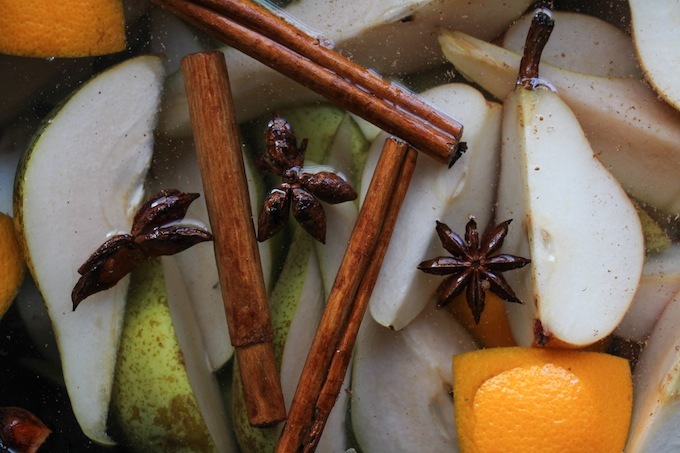 Make in the crock pot and enjoy all day with the smell of cider brewing in the air! How on Earth is it nearly November? Somehow it feels like summer was just last week, but Christmas is right around the coroner – my brain doesn’t know what to do this information. We’re in that weird time period where kids are running around decked out in Halloween costumes looking all kinds of cute and ghoulish while retailers are already lining up the dancing Santas. Holiday anarchy, I say! It’s fantastic. What’ I’ve really been enjoying this time of year is all the fall food that comes along with the season. Not only do I have an excuse to make and eat soup after soup, I feel like I’ve got even more reason to take advantage of the seasonal fruit and do some baking – tis’ the season and all that, right? I’ve got a few ton of treats in mind coming up, but before I get to the baking I’ve been dying to make my own homemade apple pear cider. Homemade cider with our homegrown apples – how lucky am I? I realized as I was making this that there is a small but distinct difference between cider and juice. Cider is basically freshly picked and pressed fruit (usually apples). It’s more robust in flavor and earthy in flavor. Apple juice is made from apple cider. It goes through extra processing and pasteurization to remove larger particles and solids. Removing the larger bits, gives apple juice a longer shelf life to keep it from fermenting while also giving it more of a clean and crisp flavor. Both of those are different from British cider which is made from apple cider with the addition of yeast that allows it to ferment and become alcoholic. Who knew there was so much on the topic of juice vs cider? Either way you’ll be happy you made this. Who needs to go out and buy fall scented candles when you know how to make your own homemade cider. I know cider like this is meant to be served hot, but I actually preferred it cold the day after store in a jar with a few spare apple and orange slices. If you do prefer your cider hard, add a little rum and you’re good to go. Whichever way you have it, you won’t regret it! Wash the apple, pears, and orange and cut them into quarters. Don't worry about removing the stems, seeds, and peels because you will strain it all out later. Place the fruit in the bottom of your slow cooker along with the cinnamon sticks, star anise, ginger slices, nutmeg and cloves. Add the water to the crock pot making sure to leave about 1/2 inch of space at the top of the pot. Cook on high heat for 3-4 hours or on low heat for 6-8 hours. An hour before the cider is done cooking, use a potato masher to mash the fruit. Cook for another hour. Strain the cider through a fine-mesh strainer or cheese cloth into a clean pitcher or pot. Stir in the maple syrup or your alternative sweetener until it is dissolved and serve hot or wait for it to cool and add ice. Use a cheesecloth the strain the cider if you want a smoother, less pulpy drink. Think I could omit the orange? My daughter can’t have citrus (acid reflux). Any substitute ideas? That shouldn’t be a problem – you can leave it out or add another apple or pear! I saw some other bloggers mentioned it but your pictures really are beautiful, nice job! The anise stars really make it look so festive – we are a cider family so I’ll be trying this one over the holidays, thanks for sharing! Ha! Just noticed you brought this to #SaucySaturdays!! (I may have begged you too) Thanks for coming.. So yummy! I’m imagining the smell, too. Beautiful pics. This looks amazing!! Pinning and Sharing! .. just wanted to stop by from Whats Cooking Love link party and say hi!! I love this idea! I am hosting a dinner party this weekend and was stuck on what to serve! I wanted to do a homemade cider, but also wanted to make it cost effective since 30 people are coming. I am totally making this! Thanks so much for sharing your recipe and beautiful photos! Yay, glad I could help! Hope everyone loves it! This is beautiful! What a fun gal inspired drink. Pinned it. Thanks so much for sharing this at Savoring Saturdays linky party. We hope you’ll come back and join us. From Scratch Cider?!?! Now this is RIGHT up my alley! Amazing! HAD to pin this! Going to beg my mom to make it for Christmas. What an amazing recipe for a heart warming cider! Thanks, Chrissa! This would be perfect for Christmas! Gorgeous pictures, Sarah! I love drinking apple cider in the fall. Must try your version with pear, sounds amazing! Love that you made it in a crock pot! This looks SO yummy and perfect for the season! Thank you! That sounds like the perfect evening! Thanks, Rachel! Ooooh i bet this made your house smell so good! Looks awesome! Thanks, Trish! I totally did – I might have to make some more just for the smell! Congratulations! I hope you have a great baby shower! Oh yay! I’d like to try cooking more desserts in the crock pot myself – if it’s as easy as everything else is then we must be missing out. Thanks, Mila! I am in nostalgia heaven right now. We made apple pear juice for a long long time and loved it every winter with our own tree fruits in our steam juicer. Lately our pear trees are gone. Your recipe looks so pretty and delicious. It makes me want to reach into my cupboards and pull out a bottle right now! Aww, thanks Diane! I bet your juice was delicious – how wonderful that you were able to use fruit from your own trees! I have never made apple cider, btu you make it look so easy and yummy. I would have no idea where to get star anise though. I was always able to find star anise in the spice section of my grocery store when I lived in the states, maybe you could try there? That looks a great and easy recipe, perfect the glut of fruit at this time of year. 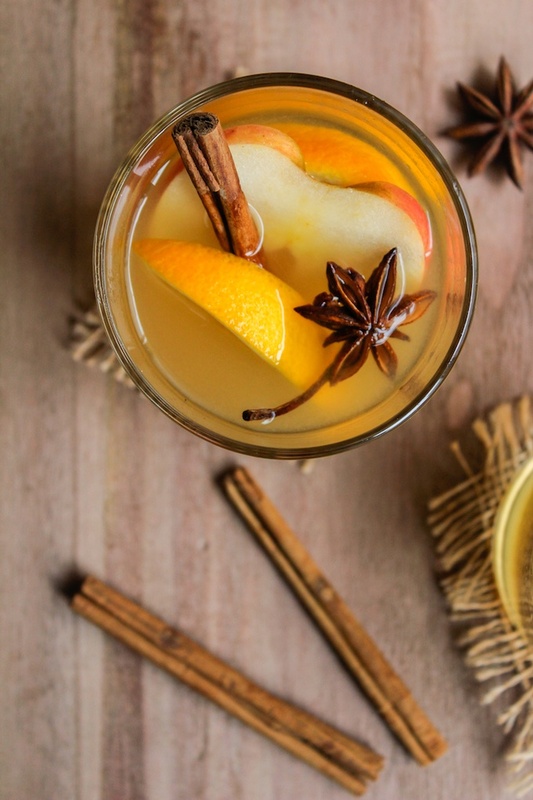 I often make mulled (hard) cider in my slow cooker, it is the perfect party drink, affordable and it does not stain the carpet if it gets spilt! Ooh, I’ll have to dig into your blog to see if there’s a recipe for hard cider – I’d love to make my own! Thanks, Helen! I can almost smell the cider aroma filling the house as it warms through! This cider sounds so good! Pinning for later! Thanks for sharing it! Thanks, Chris! You’ll love it! I had never thought of it before making this post because I always order cider when I go to a pub, but as an American I’ve always known cider as this drink you have during the holidays. Alcoholic or not, I just really love cider! I am in awe of your photos of this cider…absolutely beautiful and they make this drink look so incredibly good. Love this!! Looks absolutely glorious! Love how simple it is as well. Although I doubt I’d be able to resist it for 4 hours! Bet the house would smell amazing!